The B&B House Mariella is a former noble residence located in the immediate vicinity of Via Toledo and about 150 mt. the Plebiscito.La property is located on the fourth floor in an ancient building, dating back to the Bourbon period, with elevator. Mariella House has rooms with private bathroom, TV, free Wi-Fi, air conditioning and heating. At guests ' disposal: towels, toiletries, hair dryer and high chair. Our breakfast includes: milk, coffee, hot chocolate, oatmeal, coffee, variety of tea, cappuccino, juices, jams, biscuits, croissants, biscuits, butter, nutella, honey, bread, yogurt and fruit. 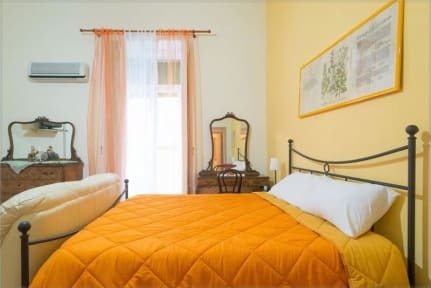 Proximity to places of historical and cultural interest such as the Maschio Angioino, the Galleria Umberto, Piazza del Plebiscito, the Real Teatro San Carlo and the National Archaeological Museum, place our property in an excellent location for those who want to enjoy the magical atmosphere of this city. A stroll along the pedestrian area of Via Toledo allows you to reach in few minutes the area of Spaccanapoli, San Severo Chapel, the veiled Christ and the Duomo. We are also just 150 mt. Toledo Metro station at 200 m from the port and 20 mt. from the Naples Central funicular which in a few minutes you can reach the Vomero district where the Certosa di San Martino. Garage on request at 150 mt. Possibility of high chair on request (free of charge) The Bed and Breakfast Casa Mariella is a former noble residence is located on the fourth floor in a building dating back to the Bourbon period. Our structure is a great place from which to visit both day and night the most beautiful places of the city. In fact, thanks to our very favorable position, our guests can reach all the major attractions that Naples offers. 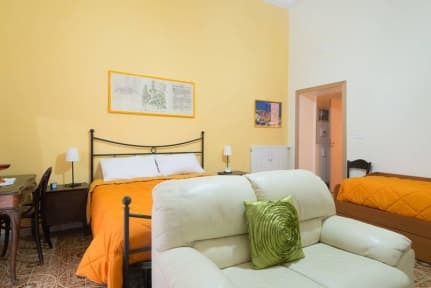 We are 100 meters from the Metropolitan Station Toledo-allowing you to move easily around the city and 120 m from the port from where the main connections to the Gulf islands and Sorrento. Only 30 m from B & B Casa Mariella en is also the funicular railway station in a few minutes you can reach the Certosa di San Martino. A relaxing walk, almost all in a pedestrian area, can be reached in about 15 minutes the area of Decumani, Piazza del Gesu, San Domenico Maggiore and San Gregorio Armeno. Our property has two rooms with balconies, private bathroom with shower and towels, heating and air conditioning heat pump. In the morning, a rich breakfast, hot drinks and juices. The style and furnishings of Mariella House are typical of Naples of 1800, an environment that evokes the ' real ' Naples, rejuvenated by lively and sunny colors and the joy of its owners.